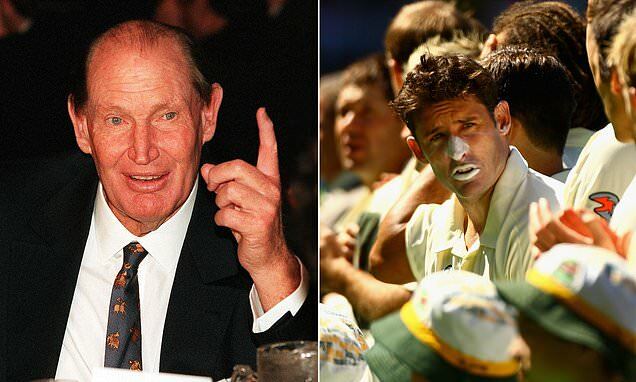 Daily Mail UK – Kerry Packer furiously called up Australian cricket selectors to demand a player be rushed into the side during the 2005 Ashes, a new book has claimed. Kerry Packer furiously called up Australian cricket selectors to demand a player be rushed into the side during the 2005 Ashes, a new book has claimed. According to a new book by sports journalist Daniel Brettig, Packer phoned Cricket Australia chairman Bob Merriman to demand Hussey be selected. ‘Get that f***ing Hussey in the side, quick,’ Packer is said to have insisted after seeing Hussey score centuries for Durham in English division two country cricket. After the conversation, Merriman apparently phoned CA chief James Sutherland and asked him to remind chairman of selectors Trevor Hohns that Hussey, was available for selection despite not being in the squad. They were revealed in Daniel Brettig’s new book titled Bradman & Packer: The Deal That Changed Cricket.